Level: Any, some experience with mosaics is helpful, but not necessary. Join Laurel True of The Global Mosaic Project in this fun weekend class during which students will learn to work together as a team to create a community mosaic mural. Description: Come spend a weekend making a mosaic mural! In this hands-on, weekend workshop led by artist Laurel True, students will work as a team to create a community mosaic project. 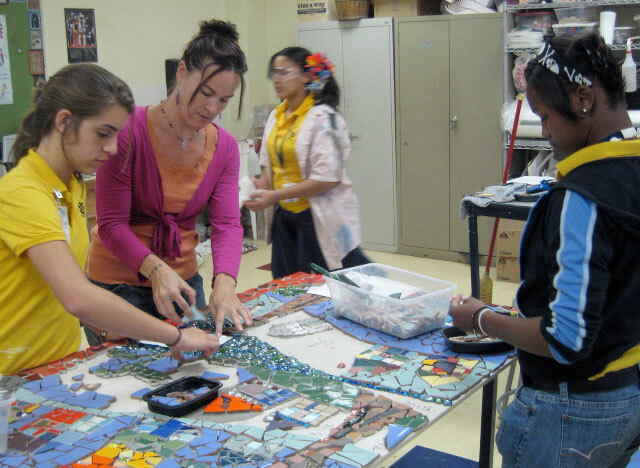 Students will experience group mosaic-making processes through the actual creation and installation of a mosaic mural. These skills can be used for facilitating future projects in their own communities. Workshop will begin with an inspiring digital presentation of community mosaic projects around the world. Lecture will cover various approaches to community outreach and design development, sourcing locations and materials and recruiting and teaching project participants. Instructor will present information on multiple approaches to project creation and best practices for technical construction methods so that projects are durable, safe and long lasting. The bulk of this upbeat and community-focused class will include hands-on mosaic creation in a group process. Students will work together to create a permanent mosaic mural under the guidance of long-time instructor and community artist. Class will focus on the use of ceramic tile and mirror mosaic. All tools will be provided for student use. Students will come away from this fun and informative team building workshop with the knowledge, skills and confidence to create successful permanent projects that engage and inspire community. This class will be of particular benefit to artists who would like to explore community-based projects, teachers, community organizers and anyone interested in neighborhood beautification or community development through the arts. Instructor Experience: Laurel True has been facilitating public and community mosaic projects for over 20 years and has helped to provide job training and arts education to underserved communities in urban environments and developing areas. She has created hundreds of projects over the years, working with volunteers, assistants, students, trades people and artists of ages on projects that reflect a sense of community pride and cultural significance in the locations where they are sited. Through her organization, The Global Mosaic Project, True has facilitated community mosaic projects in the Bay Area, New Orleans West and East Africa, Latin America and Haiti.